“How do I know if something’s in the public domain?” Public domain is a frequently used term in copyright parlance, yet it isn’t defined in copyright statutes. 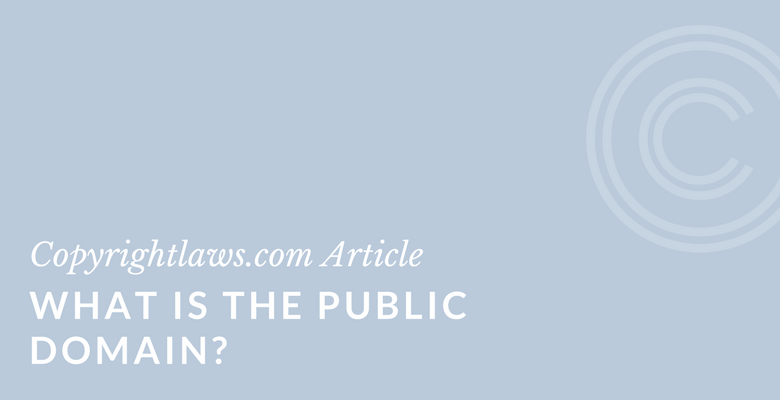 This article provides insight into when something is in the public domain under copyright law. This information will help guide you in determining when you need to obtain copyright permissions. Public domain is discussed from the U.S. perspective and also from an international perspective. To learn how to make copyright decisions relating to permissions and the public domain, see our online copyright program. This post was originally published in our weekly copyright newsletter, a free publication. Although commonly used in copyright parlance, the phrase “public domain” (PD) isn’t in the U.S. Copyright Act. It is, however, commonly used to refer to content that isn’t protected by copyright law. Works that are in the public domain may be used freely, without obtaining permission from or compensating the copyright owner. The work was produced by the U.S. federal government — In the U.S., works produced by the federal government don’t have copyright protection. However, a work produced by a consultant or freelancer to the government may have protection and may transfer that copyright to the government. Note that in other countries such as Canada, there is copyright protection in federal government works. The work isn’t fixed in a tangible form — A work such as a speech, lecture or improvisational comedy routine that hasn’t previously been written or recorded in any manner isn’t protected by copyright and therefore is in the public domain. The work didn’t include a proper copyright notice prior to 1 March 1989 — In the U.S., this doesn’t apply to works created after 1 March 1989, when a copyright notice became no longer mandatory to protect a work. However, prior to that date, notice of copyright was necessary on all published works. Without this notice, the work went into the public domain. Note that most countries don’t have a copyright notice requirement. The work doesn’t have sufficient originality — Examples of works that may not have sufficient originality to be eligible for protection by copyright include lists or tables with content from public documents or other common sources. Note that the above list of works may be protected by other areas of intellectual property such as patents or trademark protection. You may be interested in the NPR audio recording of its program All Things Considered, As Copyrights Expire In 2019, American Works Will Re-Enter The Public Domain. An adaptation of a work in the public domain may have copyright protection on its own as a new version of a work. Adaptations include translations, amended versions and annotated versions. For example, Shakespeare’s “Romeo and Juliet” may be in the public domain, but a new version with annotations or illustrations may have copyright protection in these new parts of the work. Also, due to different durations of copyright among countries, a work that’s still protected by copyright in the U.S. because of the 70-year duration may be in the public domain for the last 20 of those 70 years in a country with a 50-year copyright duration. This is an issue to consider for any online projects or websites where uploaded content will be used in countries with different copyright durations than your own country. On 1 January each year, various published lists highlight works that enter into the public domain that year. These lists are country specific. For example, the works of Dorothy Parker are now in the public domain (as of 1 January 2018) in Canada but not in the U.S.
See the Smithsonian.com article For the First Time in More Than 20 Years, Copyrighted Works Will Enter the Public Domain. nonlawyers to manage their copyright and licensing issues. You can learn copyright on your schedule and at your own pace. The Certificate program is fantastic. Beyond fantastic. I can’t recommend this program enough. It’s validating in that it reviews and supports the bits of copyright law that I’ve gleaned in doing this thing called “visual research.” It’s a great compilation of a lot of things that come up in our emails/Facebook…. I wish I had taken this course 15 years ago when I started. I wish I had taken this course anytime within the last 15 years. I feel like it’s making me a better researcher, and more confident in knowing the law behind our research scenarios.